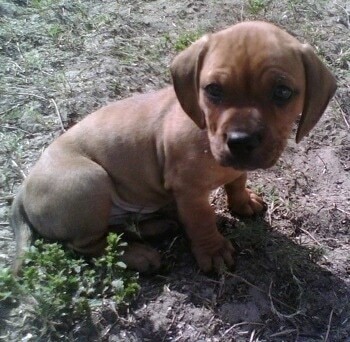 "This is Apollo, our English Bulldog / miniature Dachshund. He is at puppy at about 2 months old in the picture. 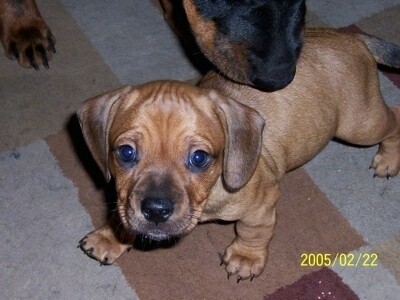 His mother is an English Bulldog and his father is a miniature Dachshund. He is the most lovable and outgoing puppy. He is wonderful. He has the long body of a Dachshund with the short legs, but his front legs are very muscular like a Bulldog and he has slight wrinkles in his forehead. He loves to cuddle. He is wonderful with children and other dogs!! He aims to please." The Miniature English Bulldach is not a purebred dog. It is a cross between the Bulldog and the Dachshund. The best way to determine the temperament of a mixed breed is to look up all breeds in the cross and know you can get any combination of any of the characteristics found in any of the breeds in the hybrid. Not all of these designer hybrid dogs being bred are 50% purebred to 50% purebred. It is very common for breeders to breed multi-generation crosses. "Apollo, our English Bulldog / Miniature Dachshund puppy at 2 months old with his Dachshund father standing over top of him."